I enjoyed another wonderful time in Germany over the weekend, and love being part of a bilingual piano project, organised by singer Kery Felske, and supported by the IKM Gelsenkirchen (in the Ruhr region). The workshop concept is becoming increasingly popular, with classes running all day on Saturday and Sunday. Young (and older) pianists are now coming from further afield, from various backgrounds, and from all age groups too. Anyone can come and play, irrespective of standard or ability, and it’s always interesting to witness the improvement made by the participants; both during the weekend and over the months between classes. Several pupils have come to every workshop thus far. Saturday’s session (which lasted around five hours), included some technical work, namely Czerny exercises and some scales. British exam boards are not popular in Germany, and some students weren’t familiar with scales, but it wasn’t long before my group digested the various keys and fingerings (the Grillo Gymnasium, where classes are held, is equipped with several practice rooms on site, allowing pupils to work on their own). Participants practiced between classes on Saturday and Sunday, and progress was most impressive. After a further all day session on Sunday, we host a late afternoon concert for family and friends, although classes are also open to the public. The concert provides a platform for every student, and it motivates them to work that much harder, because they know their efforts will be on display. I’m perpetually concerned as to whether two days is really enough to substantially make a difference to a pupil’s playing, but each student has risen to the challenge beautifully. Repertoire ranged from C.P.E Bach’s Solfeggietto H.220 and Burgmüller’s L’Orage Op.109 No. 13, to Mozart’s Sonata K. 331 in A major, and Waltz in B minor Op. 69 No. 2 by Chopin. Pupils generally present standard repertoire, but I’m looking forward to eventually hearing some Contemporary music! 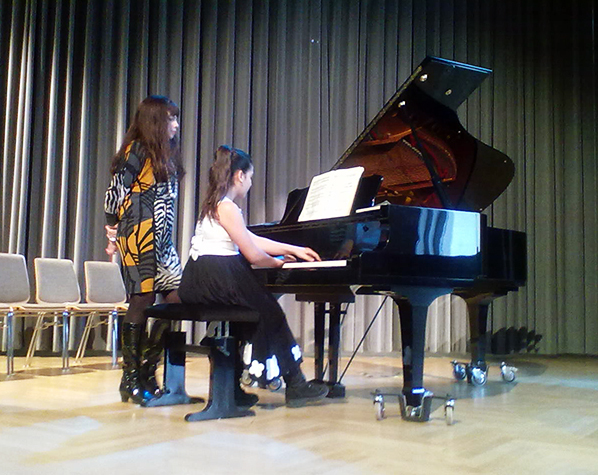 All classes are conducted in English, posing few problems for young German pianists. Several more workshops are planned for 2015, as well as a Summer Piano Course in 2016. The IKM Gelsenkirchen are involved with a variety of musical events, from pop and rock concerts, through to classical recitals. They stoically represent German commitment to culture and the arts, and I’m very grateful for their interest in this project.